and large market runs may have a positive effect on net profit. 4. Creep feeding reduces the stress associated with weaning. 1. Kids that are creep fed seldom forget what a creep feeder is. challenge to keep outf a creep feeder. 5:1 or less range (1 lb gain per 5 lb feed consumed). 4. Creep feeding does not facilitate increased stocking rates. requirements or forage intake of lactating does. pass, yet will deny entry by older goats. 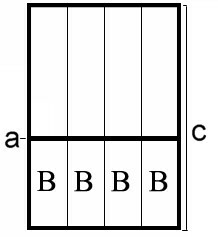 opening through which kids pass (B) can be raised as kids get older. height as the creep feeding pen, whichever is taller. during a failed attempt to enter a creep feeder. places where goats loaf during the day. Kid goats enjoy climbing. near the creep feeder may provide an additional attraction. fine particles that accumulate in the troughs at least once per week. and should therefore be removed from a creep feeder immediately. with sloping bottoms can trap kids and result in suffocation. troughs, urinate and defecate. The end result is wasted feed. kids into the creep grazed pasture. offered is best and most appropriate for my goats? help you determine which feed is the best fit for your operation. Please understand, these are meant to be minimums. eat it, the nutrient content is irrelevant. respiratory tract and only result in wastage. merit for creep feed CP levels above 18%. be refused. Minimum recommended level of either acidifier is 0.50%. be high risk for urinary calculi. (DeccoxÂ®) or monensin (RumensinÂ®). These are considered medications. typically strikes the largest, fastest growing most aggressive eaters. young kids, maternal antibodies may preclude development of immunity. or grazing is almost a necessity.